Denmark's leading hospital partner for virtualization of health services. Viewcare is Denmark’s leading telecommunications company for hospitals. 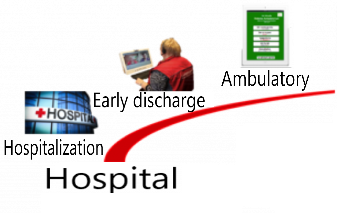 Since 2009, we have participated in and delivered some of the most innovative and visible projects in Danish hospitals. Read more about Viewcare’s various solutions for the Hospital area. Watch videos further down about remote patient monitoring and patient advantage. In an outpatient clinic, patients meet their appointment with the doctor directly through their tablet or smartphone. This saves the patient unnecessary transport time and increases the number of attendants. Medical resources are better utilized and waste times are reduced. Based on Mayo Clinic technology, Viewcare offers BODYGUARDIAN. A simple small patch-based recording device that replaces Holter, Event and Telemetry.